Colectivo 1050 is a finalist for the William James Foundation 2013 Business Plan Competition in the Idea Phase Category. Based in Oaxaca Mexico, Colectivo 1050 works with artisans in the surrounding communities to produce beautiful ceramic pieces through environmentally sustainable methods. Founder, Kythzia Barrera, is committed to this project as a way to promote indigenous cultures and revitalize the value of the ceramics craft in Mexican culture. Are you still planning or in business? We are currently operating. We began several years ago with market testing and then started sales in 2011. Right now, we employ 15 artisans and the work of each artisan also directly benefits their immediate family. On the management team I handle the day to day and sales work while our other director focuses on the non-profit. We have an administrator assistant, outsource accounting coordinator, and we have 4 voluntaries working for us in a daily basis. 2 in mexico city and 2 in Oaxaca. We also have an artisan who works to coordinate production in the villages and act as a PR liaison. Our management office is in Oaxaca City, Mexico and we have artisans working in five villages in the areas around Oaxaca. We also have a small storage place/office in mexico city. The customers we are most actively targeting are people visiting Oaxaca and other key tourist cities in Mexico. We are focusing on the tourists in these cities more so than locals because it is difficult to compete with the cheaper priced, lower quality, ceramics they typically buy. 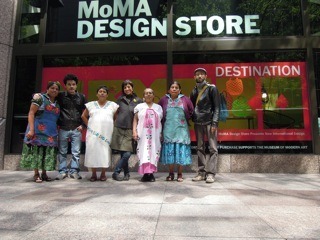 Our products are also available in a few museum shops across Mexico city, Canada and the US. Our primary goal is to provide economic empowerment for our women artisans. We do this by creating sustainable employment opportunities to these women who have been underserved by other projects. We are focused on empowering these indigenous women by providing access to alternative fuels and access to high end, global markets. For the non-profit branch of Colectivo 1050 there is the underlying goal of expanding the social value and identity of crafts. Ceramics as a craft is an incredibly important aspect of indigenous culture in Mexico. To that extent, Colectivo 1050 will be successful in Mexico only if we can pass that mission on throughout Mexico and begin to appeal to those outside of the tourist industry. Colectivo 1050 is also attempting to bridge the gap between indigenous and non-indigenous cultures in Mexico. We are aiming to do this through the revitalization of the craft and ceramics industry and emphasize the wisdom and knowledge that indigenous cultures have. We also have an important environmental aspect. This is not so much a response to the current global issue as it is to the important link between indigenous livelihoods and the environment. Preserving the environment is the only way we can save ceramics, as an important competitive advantage, for future generations. We are doing this through the use of kilns that run on recycled oil from local restaurants and eco-wood briquetts. These alternative technologies are also important aspects in our ability to set our prices and provide a livable income for our artisans. How did you become interested in that problem? Being a third generation indigenous Zapotec woman born in Mexico I find that there is great value in bridging the cultures and identities of indigenous and non indigenous populations. It is incredibly difficult to find this middle path to do so and I feel I was raised with the unique identity to find and navigate that path. In my opinion, there is a great need to bridge indigenous and non-indigenous cultures and I feel that through the revitalization of the crafts industry I can help connect them. In bridging these gaps communities throughout Mexico will become stronger and more stable. I do this because I want to find possibilities for me and for my people from within our own potential and tenacious strength. I believe crafts industry, well conducted, may become the economic motor of the whole country. I feel that in order promote the economic empowerment of our artisans we need to support the revitalization of ceramic crafts and the knowledge of indigenous cultures. There is great benefit in investing in our artisans because when you invest in the strength and wisdom of indigenous women you stabilize and preserve communities. In supporting our artisans as they produce high quality products I feel that respect for the craft will rise. In increasing the spread of the knowledge of indigenous cultures I also see the importance of bridging the gap between indigenous and non-indigenous populations. In my opinion, it is important for Mexico to fully embrace the complexities that come along with increasing collaboration and the value of different point of views, different cultures within the same society. I also know that in finding a solution to these problems you have to be aware that it is going to be slow. But its worth investing in a project that involves more complexity and takes more time to build strong foundations. Because once you’ve taken your time to build a solid foundation you have a business that will sprout and be sustainable in the long run, even without me. How has the William James Foundation competition and mentoring program helped you? The process of building a social enterprise is one that needs lots of help from as many people as possible. Without the help of advisors, mentors, and peers the path of a social entrepreneur can be very lonely and isolated. I am very thankful for all of the enthusiasm that the William James Foundation helped build around Colectivo 1050. This process has really made us feel like we were part of a larger community. The feedback was crucial and very important to get perspective on our goals and means to achieve them. For us the real benefit of being a finalist is not the potential cash prize but the recognition and acknowledgement. This will give us more credit and visibility and get us attention from even more resources. There are many challenges that arise on a day to day basis, and having the support of the William James Foundation community has helped remind us that we are not alone. One of the biggest daily challenges is simply getting it all done. Right now its mainly myself handling the day to day management and I often wish there were more hours in the day. Another challenge we are facing right now is in our search for the best system to operate our sales. We are trying to understand the strategy and are looking for outside help to assist us. We are also looking for more advisors for our board. We are trying to find the best match of hard working, enthusiastic and professional people to join our team and help sustainably grow our business. This can also be a challenge to get all of the pieces to fit together correctly. We are also looking at the best ways to grow our Canadian and American markets. We know that our products will be successful, and have been on a small scale, and are looking at how to increase our presence outside of Mexico. Increasing our presence in the US and Canada means working with more museum and design shops. We would also like to work with retailers like William Sonoma, West Elm, Jean & Deluca and Crate & Barrel as well. We strongly believe in what we do, and in what we can offer to Mexican society. Sometimes it is difficult to explain to foreigners all the complexities and contradictions this project involves because it is a very local and deep problem for Mexican society and Mexican mindset. For me is not only a business, it is not about making money by being “good, nice people”, it is a search and a way to prove that strong identities and cultural development have the potential to detonate long-term economic development that benefits us all, without betraying who we are… and that is quite a strong statement in a country like Mexico. We have many questions that still need to be ask to ourselves on the search of the scale and means of achieving sustainability in the personal, local and global levels. The enthusiasm that the William James Foundation has generated around our business has not just been limited to the mentors, judges and other entrants. Since beginning the William James Foundation Sustainable Business Plan Competition we have seen a swelling of community pride and ownership of the project. People are getting fired up about joining and have been supporting us like crazy. We are also so incredibly happy to have been selected as a finalist! I personally felt a stream of energy and motivation when I look at the screen manifesting Colectivo 1050 as a finalist; it means a lot. And now that we had come all this way, we will surely fight for the first place!